This Sunday, after a jam packed Saturday, I got around to some healthy meal prep. 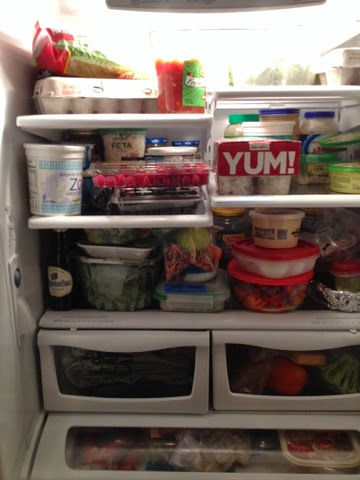 James and I are going to try and eat healthy for the remainder of May and that takes a lot of planning and preparation. I decided I was going to plan out our weeks (tentatively, because I've already veered a bit from this this week) and use it to buy groceries and meal prep each Sunday. 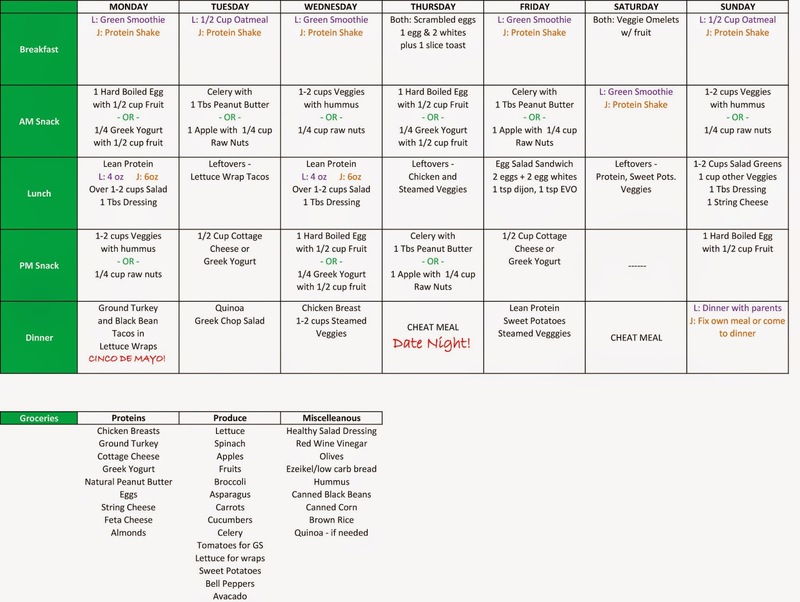 I made up this week's plan loosely based on the meal plan I had during my 28 day challenge. I tried to separate certain things that would be different between James and I with labels/colors. Then was the tough part - actually going through with it. I was a little delayed in starting my grocery shopping due to an hour and half nap some things coming up. I hit my grocery tri-fecta (Walmart, Costco & Winco, and no I wouldn't recommend it on a Sunday afternoon) and then I got to chopping, roasting and grillin'. The first thing I did was put my chicken breasts in some marinade (not pictured). I like to slice my breasts in half the long/flat way so that they are much thinner and easier to get cooked through. Do this prior to marinading if you are going to. 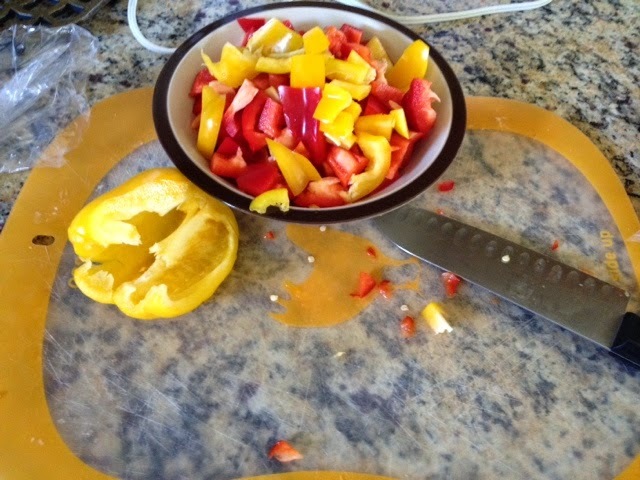 I used a pre-made marinade pack - I know it's a no-no but I'll get around to making my own soon. Next is the chopping. Tons of peppers, onions and some broccoli. 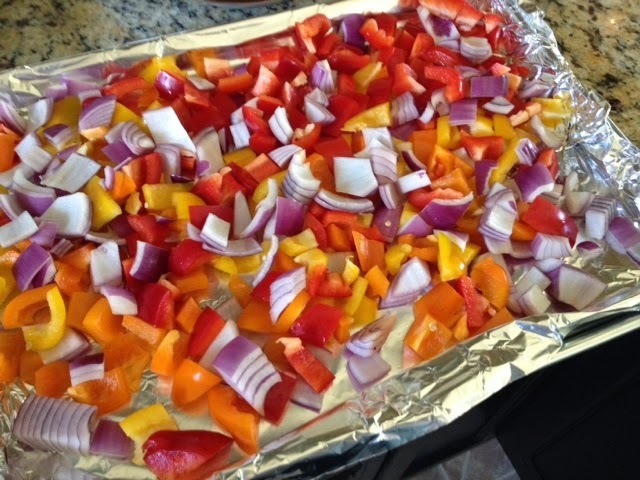 Having veggies pre-cooked and ready to go is a life saver when trying to eat healthy. I roasted the onions and peppers in the oven at 400* for 15 minutes, tossed and roasted another 15-20 minutes until they were cooked through. I'll admit, mine were a little over done, cook to your liking. I also steamed the broccoli in the microwave. 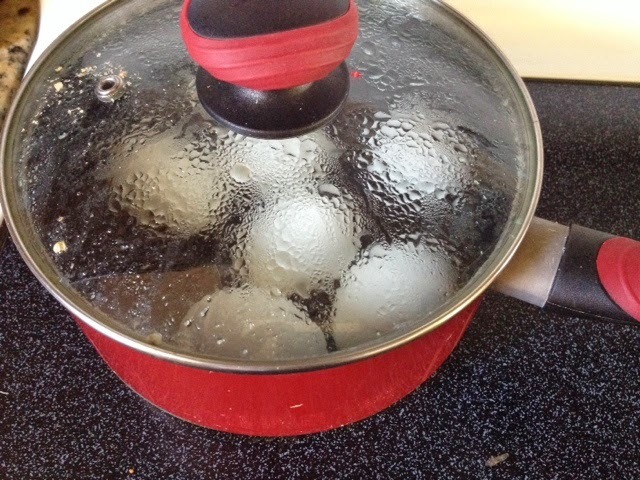 While the veggies were cooking I boiled some eggs. They are a perfect, protein packed snack! Pretty much as soon as I got the veggies in the oven I started on the chicken. 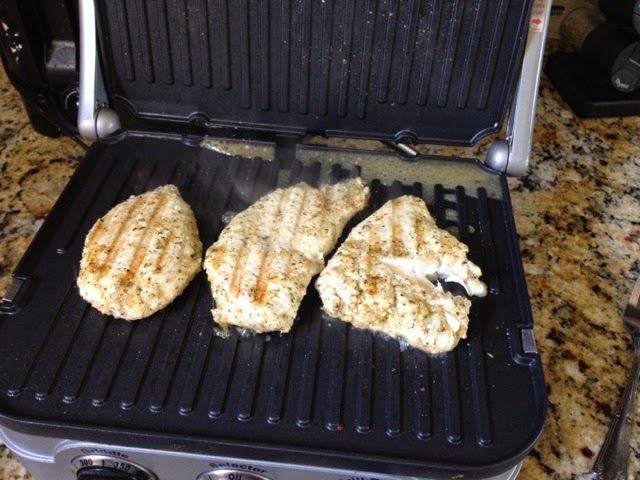 I like to grill mine using my Cuisinart GR-4N 5-in-1 Griddler. They cook through quickly and stay moist and flavorful. Plus the bonus is easy clean up - I can remove the plates once cooled and put them right in the dishwasher! Then with my chicken breasts and broccoli ready to go, I cut up the chicken and made some lunch packs. 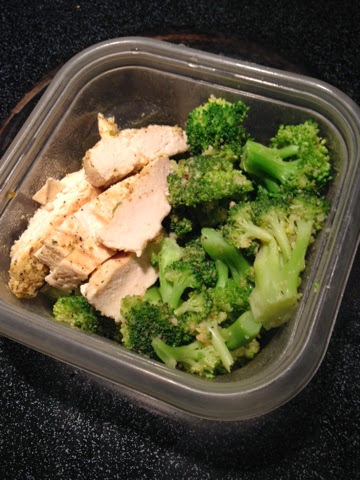 Here is an example of a lunch size portion for me - approx 4 oz chicken and about a cup to 1.5 cups of broccoli. I also made these for James - but almost doubled the protein. 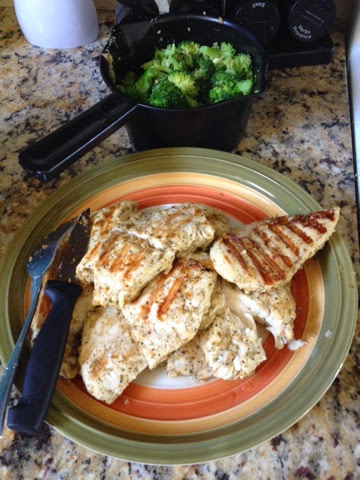 4 oz grilled chicken breast, 1 cup steamed broccoli, seasoned with leftover marinade. I tried to make his meals/snacks as fool proof as possible. I even labeled them. Found out today I should have been peeling his hard boiled eggs for him too - because HE NEVER HAS PEELED AN EGG. Weirdo. The meal below has double the protein I would normally pack for myself, keep that in mind. He's a big guy, he needs it. 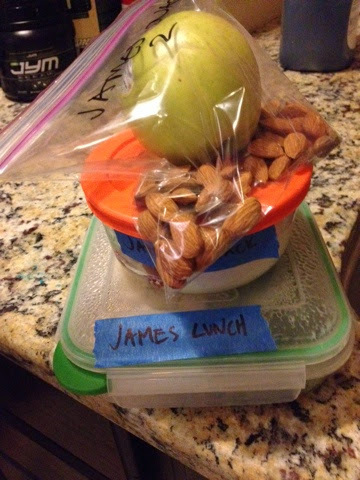 Lunch - 8 oz chicken with 2 cups broccoli, Snack 1 - Greek yogurt with berries, Snack 2 - apple and 1/2 cup almonds. We will sub these for our lunch salads in the meal plan above. I am feeling pretty good about the process and what I have set up for the rest of the week. It won't be easy, but I think I am on the right track. Even if we aren't eating healthy clean meals all the time, a little prep and pre-planning helps us eat SOOO much better than before. 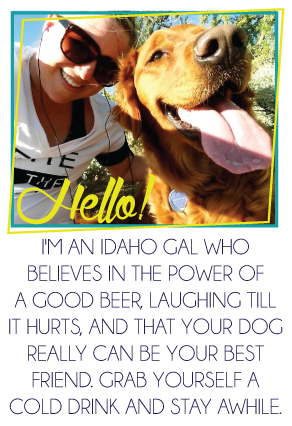 I hope to continue on my meal planning/healthy eating binge, so I'll share the journey with you as I go. Thanks for stopping by! 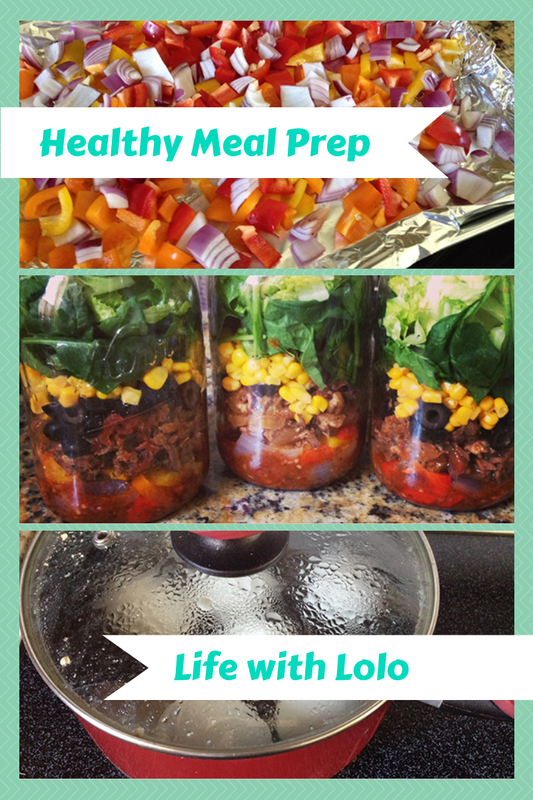 What do you do to meal plan and prep? Yummy! 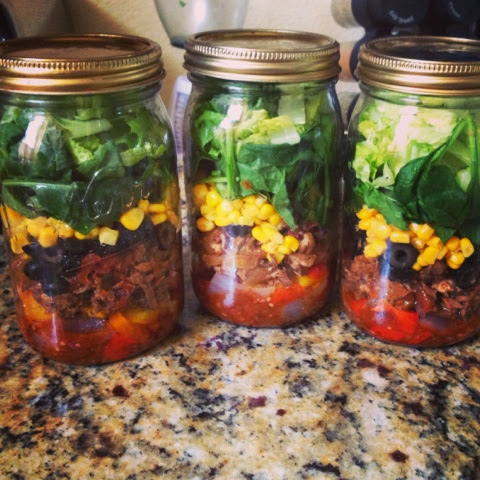 I LOVE taco salads and I would have never thought to put the ingredients in a jar? Perfect for work! Yeah they turned out great - been seeing the jar idea all over Pinterest and decided to give it a try. They last up to 10 days too so definitely a good staple for packing lunches!